The Wales Initiative for Student Engagement (WISE) was first established in 2009 as an initiative for sharing best practice in student engagement approaches in Wales. 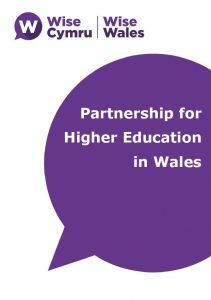 In 2014 the higher education sector in Wales launched the Partnership for Higher Education in Wales statement, making Wales the first UK nation to agree on a cross-sector commitment to partnership. The initiative also underwent a change of name to reflect the evolution of the mission statement, which is to achieve meaningful partnership between educators, students’ unions and students across Wales.